The color threads you use in these eyeglass cases are going to depend largely on the colors of the material you choose. So feel free to change them from what is in the color charts except for when the color charts call for Emerald Black as these are the tack down and detail stitches for the cat. The wider eyeglass case measures 3.5” x 6.5” the narrow version measures 3” x 6.5”. Make the fabric loop at your sewing machine before we begin the embroidery of the bag. Take the 4” x 2” strip of fabric and press both long edges into the center. Then fold in half lengthwise again and press. Stitch close to the edge of both long sides. Tip if you will be making a lot of cases in different colors have invisible thread in the top and bottom of your sewing machine to avoid changing the thread for each different colored loop. Hoop poly mesh stabilizer in a 5” x 7” hoop. Stitch the first color stop (CS) as a placement line for the eyeglass case. Spray adhesive on a rectangle of Battilizer® and position over the placement line so that the Battilizer® exceeds the placement line by ½” on all sides. Spray adhesive on the back side of a fabric rectangle and place over the Battilizer® and align with the Battilizer®. CS 2 will quilt the eyeglass case front. Use a color of your choice. In this sample metallic gold was used to match the metallic dots in the fabric. CS 3 is a placement line for the cat. 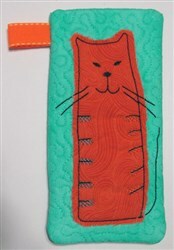 Spray adhesive on your 4” x 6” fabric for the cat applique and place over the outline. Run CS 4 in Emerald Black (1000) to tack down the applique. Trim around the applique about 1/8th” from the tack down lines. For this primitive look you do not have to be exactly even in the trimming. This is the point in where the design files may differ. 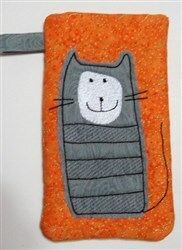 There will be one or two colors stops to embroidery the detail on the cats. Follow the color chart or choose thread choices of your own to embroider the detail on the cats, but switch back to Emerald Black (1000) to do the final outline, face and whiskers of the cat. The CS following the outlining of the cat is very important, it is the placement lines for the back of the case. 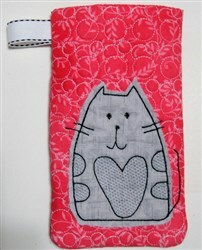 Stitch this in a high contrast color to your fabric so that you will be able to see them well. They will not show on the case when it is completed. Fold the long fabric rectangle over the remaining Battilizer® so that the Battilizer® is covered on both sides with fabric. If you are attaching a loop to the eyeglass case do it now. Fold the loop in half, position it about ½” down from the placement line just stitched and have the ends extend ½” past the edge of the quilting lines. Tape down in the seam allowance with embroidery tape. Place the folded edge of the case just below the stitched placement lines. Place embroidery tape centered over the placement lines and onto the case back. This is to ensure the embroidery foot does not pick up the case back as it stitches. The tack down line for the case back will stitch down the center of this tape. Tape the sides and bottom of the case back to the hoop. Run the next to last color stop using a thread that matches the fabric to tack down the case back. Remove the tape from the project, don’t forget to remove the tape that was used to hold down the loop. Place the remaining fabric rectangle face down over the project, align it with the fabric at the top of the hoop, but make sure it covers the tack down line of the case back at the bottom of the hoop. Tape all edges securely in place. Run the final CS to complete the eyeglass case. Trim around the case about ¼” from the seam line except where an opening has been left for turning. Leave about a ½” seam allowance at the opening. Clip the corners diagonally. Fold back the lining you just attached and the fabric next to it to expose the batting and fabrics below, trim the lower fabric and batting in line with your other trimming. Turn the project right side out through the opening. Use a wooden dowel to assist you in poking out the corners. Your project should now look like this. Yes the cat is on the inside. We have to stitch up the opening in the lining before turning the project again so that the cat is on the face of the eyeglass case. Fold in the seam allowance at the opening, pin and whip stitch together. Fold the entire case right side out, again using the wooden dowel to assist at the corners. Give the whole project a final press. Congratulations your Cat Eyeglass Case is complete! Stitch out the whole set for your craft fair and as gifts for family and friends. Award winning Digitizer, Embroidery Educator, Author and a Consultant to the Industry, Pat Williams has 20 years of experience in the embroidery industry. Pat has won multiple awards for her digitizing expertise including the 2007 Impressions Awards Grand Championship, Best of Show as well as the 1st and 2nd Place Awards.. Pat’s love of digitizing has afforded her the opportunity to write many articles for Impressions magazine in the United States and Images Magazine in Europe. She also has authored her own digitizing training CD series, “Digitizing Steps to Success.” In 2001 Pat was named “Embroidery Educator of the Year.” For many years Pat lead digitizing seminars at the ISS Shows in Long Beach, CA and for Compucon software. Pat retired from the commercial embroidery arena in 2010. She now resides in Sierra Vista, AZ. She can be reached at pwilliams22@cox.net.